A visit to the former royal temple of Mengwi, the sacred monkey forest of Alas Kedaton and continue to see the sanctuary of the temple of Tanah Lot and enjoy the beautiful sunset. One of the temples of choice for this tour is the temple of Tanah Lot. Located in south-east of Tabanan, the road forks off to the side of the sea, ending on a green hill down to the beach and the temple of Tanah Lot significant, suspended in a huge rock offshore. Separated from the mainland by a stone basin, the rock has been sculpted by the tide. Tanah Lot, with its solitary black towers and tufts of foliage spread over the cliffs, recalls the delicacy of a Chinese painting. If the rumor is to be believed, no one lives in the interior of shirnes in one of the shrines at Tanah Lot a huge snake, discreetly left undisturbed by the Balinese. Although a small sanctuary, Tanah Lot is linked to a series of sea temples on the southern coast of Bali: Pura Sakena, Pura Ulu Watu, Pura and Pura Petitenget Rambut Siwi. All these temples are associated with major mountain sanctuaries: Besakih at Gunung Agung, Pura Batur at Batur and Pura Luhur in the bush. Batukaru. The mountain temples venerate deities associated with mountains and mountain lakes, while the temples are a tribute to the spirits of the sea to guard the sea within their ritual. 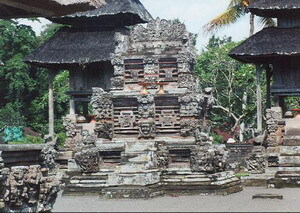 These main temples are often listed the sad kahyangan six saints “national” temples, Balinese, all taxes included. The chronicles attribute the temple of Tanah Lot of 16-century priest Nirartha. During his travels along the south coast was a beautiful landscape of Rock Island and stayed there. Some fishermen saw him, and brought gifts to guests staying in the hut. Nirartha refused, saying he preferred to spend the night in the small island. That night he talked with people fishing and advised them to build a shirne in the rock, and he thought it was a holy place and appropriate for worship. The villagers have kept their promise. The beaches of Tanah Lot are ideal for relaxation, especially in the afternoon when the temple on the rock is dissolved in a silhouette against the evening sky. The monkey forest is a group of large trees and is home to hundreds of monkeys sprite. The forest is sacred and for many years, nobody was allowed to cut wood there. A temple of foam is located in the heart of forests and is a family shelter for residents agile. You make many friends by buying a bag of peanuts and during the feast of monkeys often bring their families. Rumor speaks of a king of the monkeys is always the first choice in the selection of peanut leaflets. Is in charge of a camp, while a rival king and his followers control of another area of the forest. Alas Kedaton, often called Pura Dalem Kahyangan is located south of Menalun near Marga. It is easy to find this temple, just 15 kilometers from Denpasar, the temple Alas Kedaton linked to two different historical periods, some having been built during the megalithic period and the other part was added after Hindhu Balinese Religion adopted. Some magic items can be found in this temple dates back to the megalithic period, and there are nine arrangements of stone and primitive stone carving. A variety of symbols may point to the post Hindhu lingam Khayangan Dalem in the sanctuary, and the sculpture of Durga and Ganesh in the sanctuary of Dalem Kedaton. This temple is wild monkey. “Taman Ayun” literally means beautiful garden, walking, and this temple, located in the village of Mengwi, 18 km west of Denpasar, is indeed a most picturesque temple of Bali. It’s great past and a moat around proportions were built in 1634 by the King of Mengwi, I Gusti Agung Anom. Containing the two sanctuaries and ancient royal family has been hijacked. MERU shrines to the deities. Taman Ayun became the main temple of the ancient kingdom of Mengwi every 210 days, Tuesday Kliwon Medangsiya (Icaka following the traditional calendar), all populacegathers local temple for worship, celebration of the anniversary temple. Pura Taman Ayun The complex is divided into four distinct areas, each higher than the other. The firs of these courts, known as Java, is in the ditch, and must be achieved by the single bridge. Here you will find a small shrine, which guarded the entrance to the temple, and a large open living area where performance and control Wantilan Colts held on ceremonial days. The site west of the Bukit (hill), the southern peninsula of Bali. is the fishing village of Jimbaran dream, now the site of the Hotel Intercontinental, Four Seasons Ritz-Carlton. Stroll along the pristine sands or dinner in a seafood restaurant on the beach. Maybe a drink at sunset – Jimbaran is famous for its spectacular sunsets. A coral reef protects against the action of waves, water to swim in the corner, in Jimbaran, excellent diving, with a multitude of fish and coral for display. Rute : Mengwi royal temple, monkey forest and Ay Kedaton the temple of Tanah Lot, Roads. Cancellation made after payment are subject to penalty fees. If cancellation of 12 hours of tour departure 25% of tour prices is charged. If cancellation is made within 12 hours of tour departure 50% of tour prices is charged.